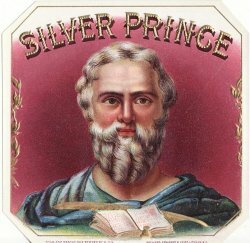 Silver Prince Cigar Box Label, 1910s. Original, unused, vintage label is 4 1/2" square. Label is embossed and gilded detailed image. Silver Prince Cigar Box Label, 1910s. Original, unused, vintage label is 4 1/2" square. Label is embossed and gilded detailed image. Heywood Strasser & Voigt Litho Co, NY, 1920s.